Catalonia – a new European state? I’m no stranger to Catalonia. I’ve been here many times: in Barcelona, in Costa Brava and elsewhere. This time, however, something is different. I can’t help but notice a proliferation of Catalan flags – and freedom flags. 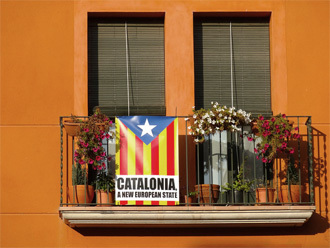 Both the red-and-yellow striped national flag and l’estelada blava (the blue-starred flag of the independence movement), wave from windows and balconies across the region. Turns out, the flags are up for 11 September. Isabel, a Girona native, explains. Just like Chile and the USA have their horror stories of this date, so does Catalonia. On 11 September 1714, Catalan troops were defeated by the Spaniards after the 14-month-long Siege of Barcelona. Many of those who defended the city on that fateful day died and are buried at Barcelona’s Fossar de les Moreres, now a memorial plaza. Nowadays 11 September is Catalonia’s national day, celebrated with flower offerings at Fossa de les Morenes and at other important monuments throughout the region, and with demonstrations and waving of the red-and-yellow striped flag. As I wander past one flag-draped balcony after another, we’re 11 days past the national day. One would expect the flags to have been taken down by now. Not so. “This year is special,” I hear again and again. The sentiments seem to run especially deep this year. An age-old dream of Catalan independence seems within reach.